Sinusitis causes | What’s causing my sinusitis? There can be many different reasons why the sinuses become blocked or infected. Sometimes inflammation can occur as a result of a virus such as the cold, or other times it can be a reaction to air pollutants. 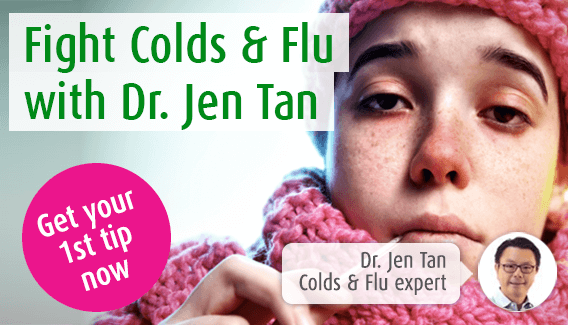 Our immune system expert, Dr. Jen Tan discusses the underlying causes of sinusitis and how they can be eased using conventional medicines and natural remedies. Sinusitis is a condition which arises as a result of inflammation in your sinuses - small air-filled cavities around your nose and forehead. These sinuses can become blocked, infected or inflamed. The causes of sinusitis range from a simple cold to anatomical abnormalities of the face. Understanding the cause of your sinusitis will help you to find an effective treatment. Cold and flu infections, caused by viruses, can result in sinusitis. When your immune system detects the virus, it triggers an inflammatory response. This causes inflammation of the mucous lining of the sinuses and also thickens the mucus in the nasal passages in order to trap and kill the virus. The result is that your sinuses can easily become blocked as the thickened mucus cannot easily drain away. It is likely that this will clear once you have fought off the cold or flu virus. However, in some cases a bacterial infection can develop in the blocked sinuses which is likely to remain long after your cold has gone. This may require treatment with antibiotics. Allergies arise as a result of a reaction of the immune system to a trigger, whereas a food intolerance occurs because the digestive system is unable to break down certain food types. Your immune system reacts to ‘foreign objects’ in a similar way as to a potential virus and triggers an inflammatory response. However, in the case of allergies, the foreign body is unlikely to be harmful; instead it can be anything from a particular type of perfume to some types of food. With a food intolerance, certain proteins or other types of molecules in food cannot be broken down. This irritates the lining of your gut and triggers that inflammatory response again. Sinus problems can be associated with lactose and gluten intolerances. The lining of your nasal passages and sinuses are covered with small hair-like structures called cilia. These beat rapidly to sweep mucus and all that is trapped in it, out of the particular area of the body. Smoking and other pollutants damage these fine cilia reducing their ability to sweep mucus away. This means that mucus and bacteria accumulate in the sinuses, and may lead to infection. Although the links between these two activities may not be immediately obvious, both involve change of pressure in the nasal passages. In diving, the increased pressure forces water into the ears, nasal passages and sinuses and can give rise to blockages in the sinus cavities. Spending a long time underwater, where the pressure is higher, can result in sinus problems, particularly if the pressure in the ears is not equalised. Flying leads to the opposite problem but the result is the same. Air pressure is reduced during flights when cruising along at 30,000 feet. However, the most problematic time for sinuses is when taking-off and landing as it is during these periods that there is a rapid change in pressure. Your sinuses struggle to adapt to this quickly enough. In severe cases, the pressure in the sinuses can increase so much that it can result in a perforated eardrum or infection. This is more likely if you already have sinus problems. Decongestant nasal sprays may bring relief from symptoms of blocked nose and sinuses, but prolonged use can result in something called rebound congestion. This is because your body builds up resistance to their effect and they no longer ease your symptoms. However, resistance to certain herbal nasal sprays does not occur in this way. For example, A.Vogel’s Sinuforce Nasal Spray combines fresh extracts of peppermint, eucalyptus and chamomile oil and can be used for up to 30 days. If you become dehydrated or are spending a long time in a dry environment, such as in an air-conditioned car, you may be more prone to sinus problems. This is because the mucus in your nasal passages loses moisture and becomes very thick and sticky. It is unable to drain effectively. A humidifier may help, but it is most important to ensure that you drink plenty of water and other hydrating drinks. Caffeine and alcohol will have the opposite effect as they are dehydrating and are more likely to lead to further sinus problems. Some people seem to be predisposed to sinus problems from birth because of anatomical abnormalities. This may be because of a cleft palate, or simply because the nasal passages are too narrow to allow proper draining of mucus. In some cases, it may be that the centre of the nose is shifted to one side. This is known as a deviated septum. This can also occur after injury to the face, most commonly a broken nose – sometimes seen in rugby players. If these abnormalities are serious and are causing breathing difficulties, surgery is usually an effective option. However, you will need to discuss with your doctor the best possible option for you. Certain long-term medical conditions can lower immunity or reduce the function of certain mechanisms in the body, which may lead to sinus problems, or other health concerns. For example, cystic fibrosis is a condition in which the airways and digestive system can become clogged with thick, sticky mucus. In these cases it is the underlying medical condition which should be treated, rather than sinus problems, as this will bring the most effective long-term relief. Looking for a treatment to help relief the symptoms of sinusitis such as nasal congestion and catarrh? To find local independent stores in your area that sell Sinuforce Nasal Spray, simply type your postcode below. Sinuforce - For the relief of nasal catarrh, nasal congestion and a runny nose. As the A. Vogel Immune System expert, I recommend Sinuforce Nasal Spray with menthol, to help relieve the symptoms of Sinusitis. Sinusitis can cause you to experience a headache, which normally manifests as a deep throbbing pain characterised by a feeling of pressure around the sinuses in your face and forehead.